So, that was the week that………. it never seemed to stop raining with the odd thunderstorm thrown in for good measure. Maybe that's why the kitchen has been the heart of the home a little bit more than usual, well when it's wet outside and you can't play in the garden there is only one thing to do. Let me tell you about my new toy the Panasonic bread maker, why I left it so long to get one of these beauties astounds me. All I have to do is put flour, salt, sugar, butter and water into the bread pan, tip yeast into the dispenser, put any extra ingredients such as poppy, sesame, pumpkin and linseeds into another dispenser, choose the menu setting and loaf size, set the timer and head off to bed. Next morning the aroma of freshly baked bread wafts up the stairs, a great start to our day. (Please excuse me if in my excitement I’m preaching to those of you who regularly perform this magic in your own kitchens on a daily basis but I am quite besotted). The SP took me rather seriously when I said I needed to order organic flour over the internet. 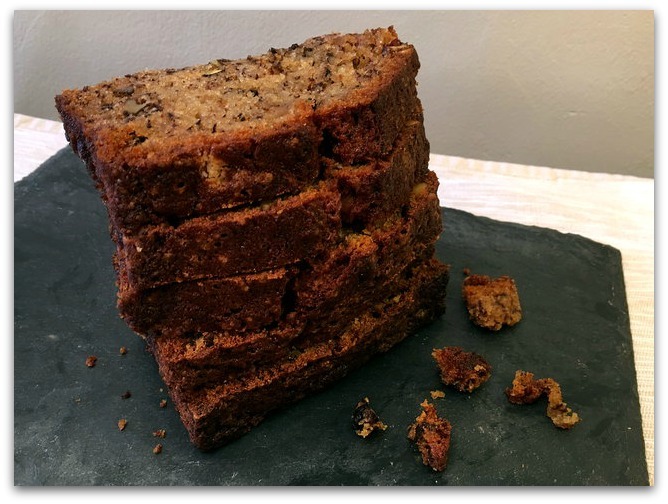 A delicious sweet treat we’ll be enjoying often, perfect either with morning coffee or afternoon tea. 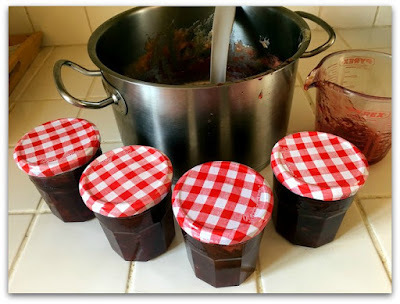 Backtracking slightly, in August our neighbour very kindly brought me a large bag of plums from his garden which I turned into jam. A few days ago he brought apples, such a nice young man! It took just 6 of them to make an apple cake and four jars of spicy apple, raisin & tomato chutney to enjoy on curry nights. For the chutney I used a recipe from Mary @ One Perfect Bite, a food blogger whom I’ve followed for many years. You can get the recipe here (or from my Pinterest board) if you’d like to give it a go, so easy and very tasty. And finally from the kitchen… on Thursday I bought a brioche loaf from some children who were out in the village raising funds for the Cartigny L'Epinay/Verlar Twinned Town committee. 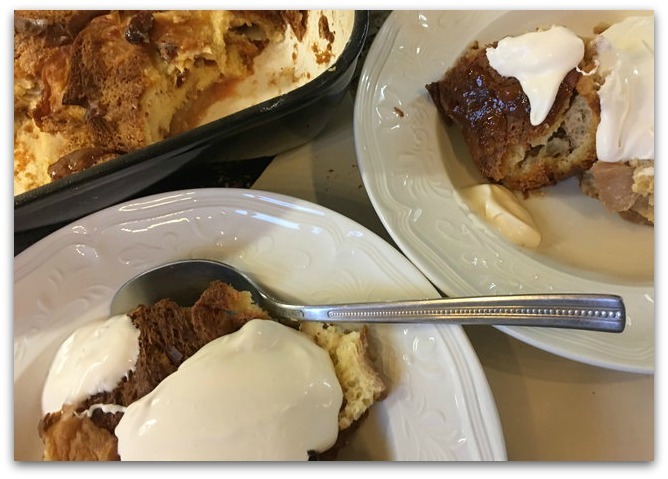 On Friday 4 apples and a handful raisins turned the brioche loaf into a delicious pain perdu (bread and butter pudding). A large dollop of crème fraiche and dessert was ready to serve..
One last thing…………just wanted mention a book that kept me company during the rainy afternoons this week “The Chemist” by Stephenie Meyer (author of the Twilight series). I highly recommend it, the SP enjoyed it too. It was a good week for satisfying appetites……………………………..
What fun your week was. I love stocking up on things and canning - and neighbors who share, or who we can share with - and baking yummy things and I think I'd love a bread making machine. I've made bread for years and years and as the years go on my arms think they might like a bit of a rest. Hmmm - christmas list maybe? 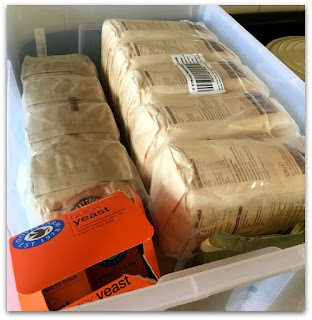 We have a rainy season coming on - and I do love homemade things - I think I'll start with oatmeal/raisin cookies tomorrow - and see what catches my interest after that. I don't need anymore flour right now - I get great organic flour from Target - and you can pick it up the very same day - they will ship it - but I often am too impatient for that. Love stores that have online shopping and pick up. My kind of shopping - more time to spend at home having fun. Hope your week ahead is grand, and full of yummy things to eat. Oh my, Maggie! Your fresh bread looks heavenly! 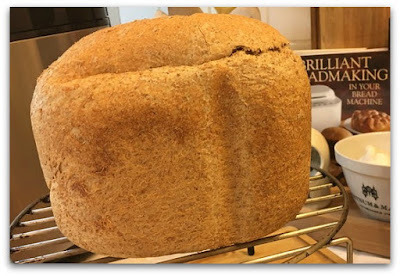 I would love an auto bread maker but I am trying to cut down on carbs and can't trust myself that I would not eat the entire loaf of fresh bread! Maggie, I am so delighted to see you back up and running again this week. Two weeks ago I missed posting due to family arriving from being evacuated from Florida by two hours. I always so enjoy the gathering on here and I appreciate so much your sweet efforts in hosting us. Your share this week, what fun you had. The bread maker...my kitchen is so tiny, and only so much space for gadgets. I have thought about a bread maker before, but I have no place to tuck it. The breads you made look so yummy and I can only imagine the aroma of them baking. I always enjoy a good rain so that I am forced to stay inside and get caught up. We need rain so badly and I would enjoy a day like you had very much. I've done a week that was over on my blog too. My that bread looks delicious, I can almost smell it from here. And plum jam! yum! 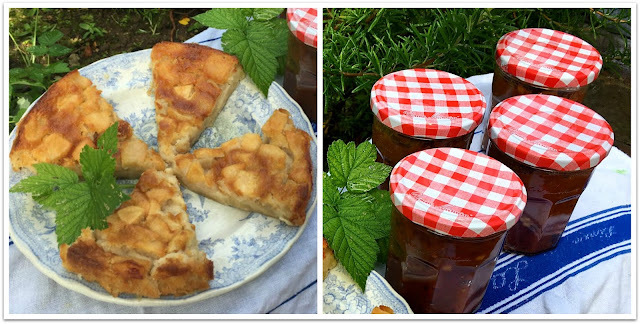 And apple pie and apple chutney! It all sounds delicious! 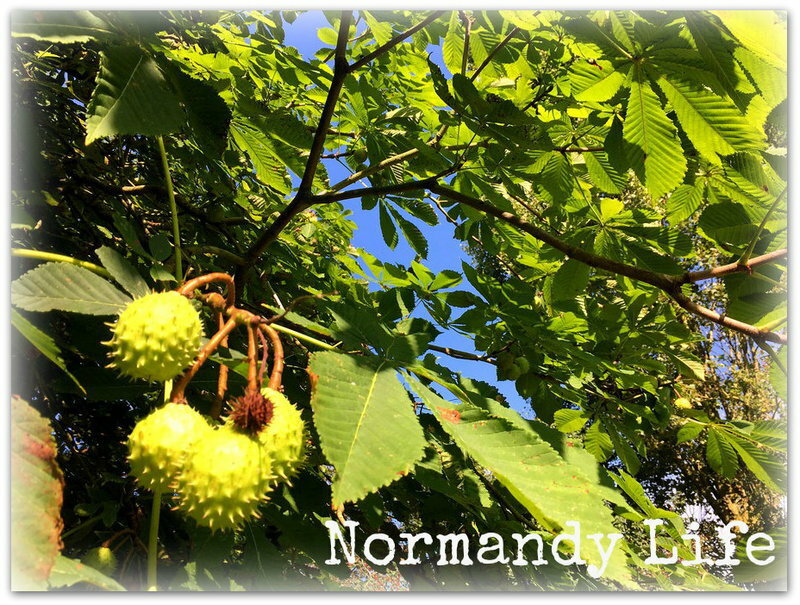 Have a happy week and thank you for the link up. Your kitchen has been full of delicious smells this week. We are having very hot weather, unusual for the end of September. I've added 2 posts this week, one for the missed week and one for today. Maggie, Rain does change our focus. We are headed into a warmer week this week so once my commitments are done on Thursday it will be a few days of R&R. Have a great week. Sylvia D.
Wow! You're all set for winter baking! I love fresh bread and made all of our bread when my kids were growing up...not as much now. The bread machine looks like fun! I should give you my favorite honey wheat bread recipe. I'll look and see if I've blogged it at some point. Enjoy your day! Happy MM! 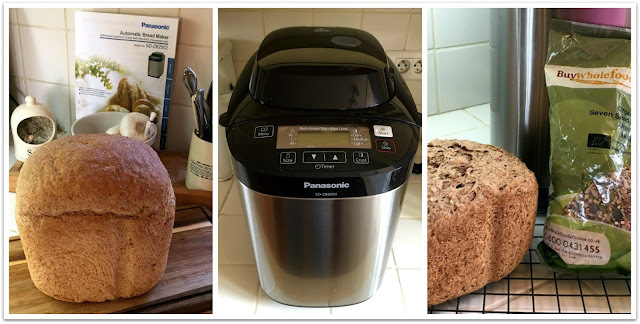 Yay for bread makers! I like to use the dough setting and then bake it in the oven (plus, I like the shape of regular loaves). I hope you get some sunshine this week, Maggie! Who wouldn't enjoy waking up to the aroma of bread baking. Your kitchen has been very busy this week with some yummy results. Hope you have a good week ahead. No mosaics from me this Monday. 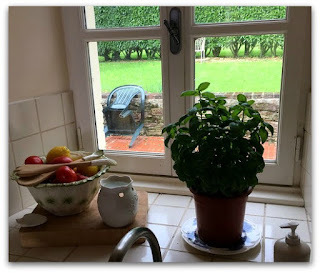 What a wonderful time in the kitchen while the weather was wet. Waking up to fresh bread and then making jams and reading a good book, almost a dream come true. Thanks Maggie for your 54th Mosaic Monday, always look forward to visiting, reading your wonderful posts and joining in. You had an amazing and productive and perfect Autumn week. I'm thinking the combination of rainy weather and no internet may have contributed something to that! All your kitchen creativity looks wonderful --- and I am amazed that you got a lovely dessert and that many jars of delicious-looking chutney from only that many apples. (And What a nice neighbor you have!) Thank you so much for hosting -- i'm so glad you're back. You certainly made the most of your time in the kitchen. There is something so satisfying about baking while the rain falls outside. Our autumn is slow to come; we've had a little rain, but I know there will be more. Your bread looks wonderful - did you enjoy the crust sliced warm? 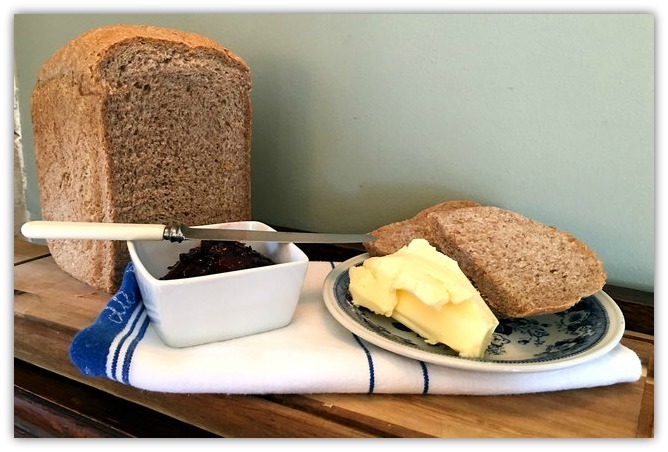 I treat myself to one hot slice fresh from the oven with butter and honey or marmalade. I need some of that rain! It's dry here in Virginia. Dear Maggie - The foods special to autumn made my mouth water. I feel increasing eating appetite only to see them. I can relate to the aroma of freshly baked bread filling the air of your home. My daughter has Panasonic Homebakery, too. In addition to breads, she likes to make pizzas using the dough made by using the Homebakery. Wish you a lovely week. Oh, it all looks yum -- and so beautiful! (I save my Bonne Maman jars too! They're so pretty!) I'll bet your kitchen has smelled just fabulous lately and your lunches and dinners stacked with goodness! Maggie - it just so happens that Spousal Unit and I are making plum jam right now with plums from our next-door neighbor! It seems to me that the rain was a blessing, with all the delectable that came out of your kitchen! I think my favorite would be the bread and butter pudding! Lindas imagens e momentos deliciosos. Feliz fim de semana.